Circa 1854. - Photograph of John Meagher, Carleton Merchant. "John Meagher (1805-1876), an Irish merchant from Carleton marked, in his way, the history of the land in the XIXe century. He was born in Halifax, Nova Scotia and distinguished himself in the areas of commerce and politics. With his wife, Mary Ann Drake, he moves to Carleton in the years 1840. John's commercial and maritime activities affect principally the areas of wood and fisheries. In addition to commerce, Meagher is greatly interested in politics. 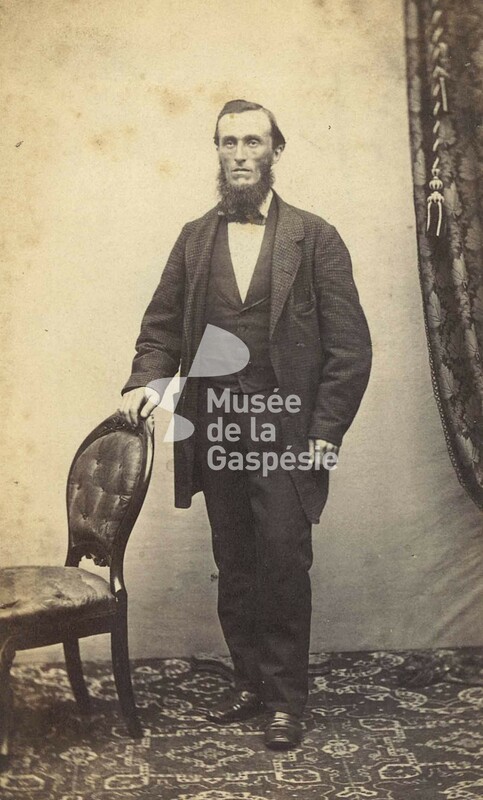 Although he was defeated in 1848, in 1854 he is elected deputy of Bonaventure and further reelected in 1858, he and lost again in 1861. John passes away on March 11th 1876." Musée de la Gaspésie. Collection Andrée D'Amours. P284/56.